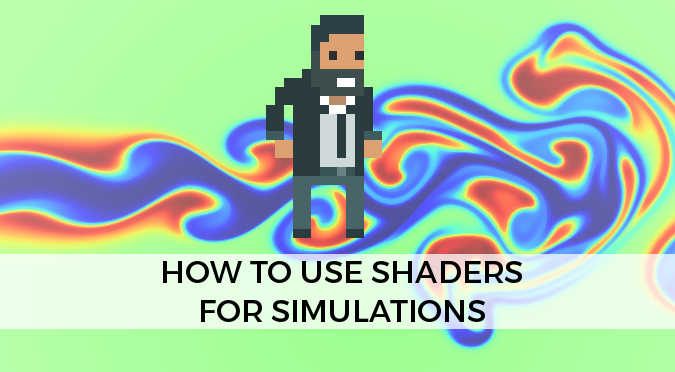 This series of tutorials will teach you how use shaders for simulations; in particular how to use them to simulate fluids. 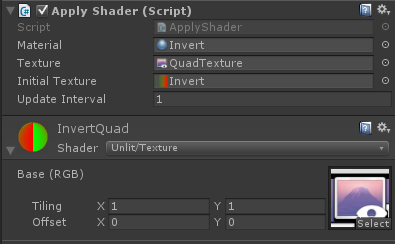 This first post will focus on how to continuously process a texture using a shader. This technique is at the heart of most simulations and will be used in this series to implement shaders that simulate smoke and liquids. In the context of traditional materials, this doesn’t really make sense. There are situations, however, in which we want to repeat a certain process. Simulating how smoke diffuse, for instance, requires a constant computation. For this toy example we will create a shader that simply inverts the colours of a texture. The buffer is allocated with the same properties of the original render texture. The last step is now to invoke the UpdateTexture function periodically. All the code written so far requires a shader in order to process pixels. Post processing requires a vertex and fragment shader in order to work. For this specific example, we will create one that simply inverts the colour of the image it receives. Update Interval: how often (in seconds) this scripts will be called. There are many interesting applications of this technique. The next tutorials in this series will explore how the ApplyShader script can be used to simulate water and smoke that are both realistic and interactive. There are other interesting applications, especially when it comes to computations that are highly parallalisable. A future tutorial will explain how to efficiently simulate Conway’s Game of Life within a shader. If you want to use shaders to perform computation, you might be better off using Compute Shaders instead. Unfortunately they are not supported on all platforms, and there’s a general lack of resources on them. Using “traditional” shaders to simulate smoke and water is a little bit of a stretch, but requires little new knowledge and runs on everything that support shaders. You can download the Unity package for this tutorial here. The next part of this tutorial (How to Simulate Smoke with Shaders) will focus on how this technique can be used to simulate the diffusion component of particles (such as the ones that compose smoke) into a fluid (like air). what’s different? does the buffer is necessary needed?